If we really wanted to hear the word of Patriarch Josyf about what we should do today, he would have told us to build a patriarchate. This was stated by the Father and the Head of the Ukrainian Greek Catholic Church His Beatitude Sviatoslav in Kyiv on February 9, 2018, during an open discussion "PATRIARCH JOSYF SLIPYJ: WE MUST BE OURSELVES!" held at the end of the Anniversary Year dedicated to the 125th anniversary of the birth of Patriarch Josyf Slipyj. "I know that this topic is very delicate and wide. For more than 50 years, it has gained various dimensions: emotional, scientific, and even socio-political. I can not now analyze all the arguments for and against, but my job is to get you to discussion, and therefore to serious work, so that the patriarchate which we have a duty to develop and build, could be achieved, like the crown on the Head of our Church, of which Patriarch Josyf wrote," said His Beatitude Sviatoslav. The Hierarch presented the text of the Testament of Patriarch Josyf to the participants of the discussion and drew attention to the four documents that, in his opinion, are extremely important and valuable in relation to the patriarchate of the UGCC. In particular, this is a letter from Metropolitan Josyf Slipy to Pope Paul VI, dated August 19, 1963, in which the then Metropolitan asks to provide to our Church a patriarchate, and a document of our bishops, members of the Second Vatican Council, who appeal to the Pope with a request for patriarchate. Also, the Head of the UGCC reminded about the pastoral letter of His Beatitude Lubomyr from 2004, which for us today is a bridge from the 1960s to our reality. His Beatitude Sviatoslav recalled that Patriarch Josyf wrote: "And I ask you, my dear children, never to give up the patriarchate of your suffering Church. You are living children of her ..." At the end of this letter and further he already signed as "Patriarch Josyf." "The next phrase is extremely important, because it expresses the internal ontological content of our Church: "Therefore, I command you: pray for the patriarch of Kyiv-Halych and all Rus’, anonymous and still unknown. The time will come when the Allmighty Lord will send him to our Church and declare his name. But we already have our patriarchate …" And it is with those words that we already have a patriarchate, I would like to start discussing the basic documents and letters to the Holy Father ..." - added the Primate. According to the Head of the UGCC, Patriarch Josyf saw the only patriarchate in Ukraine. He understood its ecumenical significance and ecumenical dimension. "This is a testament. And now we have a task how to understand it and how to implement it," says the Head of the Church. "Patriarch Josyf says that we are already a patriarchal Church. He speaks about various stages of the history of Ukrainian Christianity of the Kyivan Church, mentions various kinds of discussions that were conducted by the Unitarian and Orthodox part of the Kyivan Church. Consequently, there were certain competitions, certain thoughts, intentions that emerged in various European capitals, in particular Vatican, to prove that we are a patriarchal Church. We have all the necessary rights and attributes that the Church, which can be called patriarchal, corresponds to. And so he said: "Therefore, holy Father, I ask you to give our Church a patriarchate", - said the Primate. The Head of the Church also declared the absolute relevance of the pastoral letter of His Beatitude Lubomyr (Husar), dated August 2004, about the formation of the structure of the Ukrainian Greek Catholic Church. "His Beatitude Lubomyr says in this letter that our patriarchate is not an end in itself, our patriarchate is a way. What is the ultimate goal? The ultimate goal is a flowering and full life of the Church of Kyiv. The patriarchate is a state of mind, the highest manifestation of the essence and calling of the Church," said the spiritual leader of the Greek Catholics. According to him, there is a kind of polemic aimed at instrumentalization of the theme of the patriarchate with a political purpose ... "In this letter, - says the Head of the Church, - His Beatitude Lubomyr says that the ecumenical dimension is perhaps the most important. Perhaps the most painful… And let's say to ourselves frankly, this is the only reason why we still have no patriarchate today." His Beatitude Lubomyr cited five reasons, excuses, why we have not recieved patriarchal dignity yet. And, unfortunately, the opponents of the patriarchate present them as an axiom and do not recognize any other points of view. The Head of the Church reminded these objections: "First, the patriarchate of the UGCC will weaken the communion with the successor of St. Peter. And consequently, it will weaken the connection with the whole Catholic Church. The second reason - the patriarchate will mean the creation of a nationalist-colored Church that will sow hatred against all others. Third, the patriarchate of the UGCC would be a major obstacle to the unification of Christians in Ukraine. Fourth, the creation of the patriarchate of the UGCC would mean the neglect of the rights of the Moscow patriarchate, which considers Ukraine to be its canonical territory. And the fifth - the patriarchate of the UGCC would have led to the preservation of Uniaticism, which was condemned as an inappropriate way to achieve unity among all Christians." "I think," the Head of the UGCC added, "this is a complete list of all the reasons that can be repeated as an axiom. It is pointless to argue against each of these points. And even His Beatitude Lubomir did not want to do this. His Beatitude stressed that nobody even inquired who Greek Catholics were. Nobody took a closer look at the Church, which wants to be herself. I would like to address this issue only in the light of contemporary discussions about the creation of a single local church in Ukraine. For then those five points can be reduced to two, which, de facto, are repeated by the hierarchs of the Orthodox Churches in Ukraine. " The first myth, according to the Head of Church, says, "Well, look, the Greek-Catholic Church is in unity with Vatican, similarly as the Ukrainian Orthodox Church with the Moscow patriarchate. That is, according to such polemics, there is absolute conformity here, they say, why do you say we are to be separated from the MP if the Greek Catholics successfully keep hold of Vatican." "And here it is shown," said His Beatitude Sviatoslav, "an absolute misunderstanding of the role of the Holy Father as the Ecumenical Patriarch. It is absolutely possible to see the projection of such, I would say, yet not very developed Orthodox ecclesiology on the concept of the Universal Church. There is one clear misunderstanding. Therefore, I think our patriarchate has a great mission to explain to the Orthodox world the essence of ministry of the successor of Apostle Peter without weakening our communion with him." What does this testimony mean? "By addressing and explaining who we are, - the patriarchal Church in communion with the Roman Apostolic See, - we must say: our Orthodox brethren, we are not part of the Latin patriarchate. We are building ours. We want to be in communion with the Roman Apostolic See as a full national Church of our own right, which bears witness to the unity of the Church of Christ in the way in the first millennium in communion with the Roman Apostolic See there was the Antiochian Patriarchate, the Patriarchate of Jerusalem, the Patriarchate of Constantinople and all other local Churches," stressed the Head of the UGCC. "The Moscow patriarchate, - convinces His Beatitude Sviatoslav, - does not have this church memory, because it was born and arose after the so-called great schism. Therefore, it is difficult for them to comprehend it. I have never heard that the Ukrainian Orthodox Church competed for its patriarchate. For never any of the present Orthodox patriarchs has claimed or claims to be the Ecumenical Hierarch." According to him, the next axiological myth is that the only local Church in Ukraine can only be obtained when the Greek Catholics renounce communion with the Roman Apostolic See. And only then can unity of all the heirs of Kievan Christianity take place. 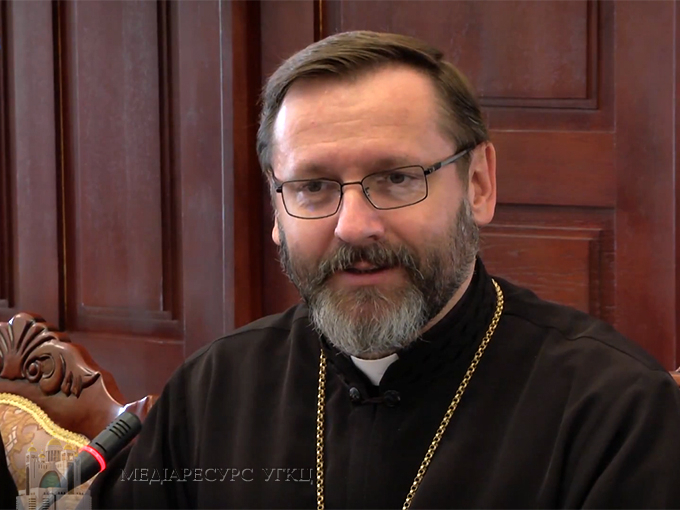 "And here, I think, is the great task of our Church -to testify to both the Orthodox Churches in Ukraine and the Apostolic See of Rome, that our patriarchate can foster the unification of the Churches," stressed the Head of the UGCC.